Lasting Impressions | Promotional Products & Apparel | Kirkland, WA - New Year - New ERA! Just when you thought you had opened your last gift for a while, Lasting Impressions would like to offer a winning strategy to get your business off to a roaring start in the year ahead. New Era is a Buffalo, New York brand that became wildly popular among millennials for their team-branded caps. Now, fashion-conscious 20-30 year- olds recognize the New Era brand as a leader in sportswear, and shop for it by name. Lasting Impressions has created a partnership for the coming year that will allow you to purchase customized New Era merchandise for your employees or your customers. Be sure to ask us about decoration strategies beyond the traditional corporate left chest imprint. Millennials want to be unique. We can show you how. 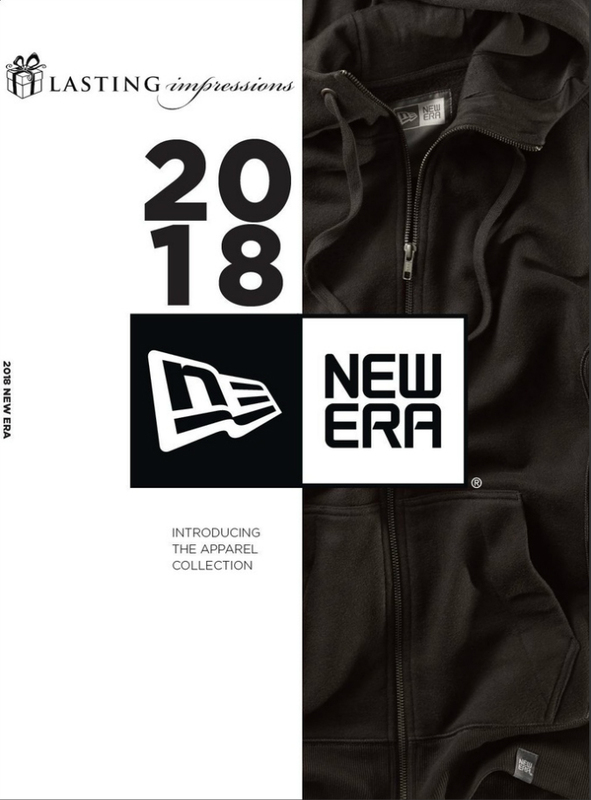 New Era is well known for its beautiful sueded French Terry sweat shirts and hoodies. Their French Terry is a 52% to 48% cotton and poly blend with just the right amount of stretch. It's soft, yet durable; thick and cozy. Their heritage blend shirts and jackets are 60% ring-spun combed cotton and 40% poly. They all wash like a hankie and wear beautifully for years. Choosing a New Era brand shirt, jacket or cap means your logo or message will be paraded proudly in public, for years to come. People are surprised and pleased to receive it because of the popularity of the brand, and eager to wear it year after year because of the timeless styling, the great fit, and the quality fabric. There's a reason why 34% of all promotional merchandise dollars are spent on apparel. The next most popular category, branded drinkware, is not even a close second, at only 9.45%. Branded apparel is part of a smart strategy, and Lasting Impressions would like to make it even smarter for you with our decades of experience and expertise as strategic marketers. Take a look at our digital catalog or shop our apparel website. Give us a call at 425.822.6651.